If, like me, you like your Africa wild, really wild, then there aren’t too many places left where you can go. African safaris these days are beset with grand and wonderful lodges replete with splendid artefacts, fantastic guides, great food, and rewarding sightings of game, but if your soul hankers for vast untrammelled landscapes, where the imprint of man is little to be seen, then there are fewer and fewer places to choose from. So let me tell you about Tswalu. Tswalu lies on the northwestern edge of South Africa’s Northern Cape Province, right up against the Botswana border, and is technically part of the expansive Kalahari. Today there are regular direct charter flights from Johannesburg and Cape Town that make it infinitely easier to get to, so a visit could easily be fitted into a trip to almost any South African destination. 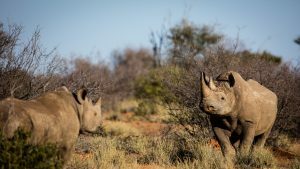 Its 1,100 square kilometres of rolling Kalahari dunes and semi-arid grasslands (which makes it more than twice the size of Isle of Wight) are home to some 70 different mammals and nearly 300 different birds. 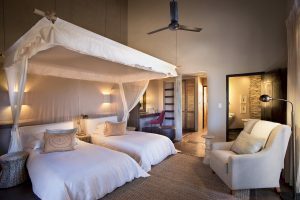 It is the largest privately owned game reserve in South Africa and the 30 guests that it welcomes to its lodge and private villa have all this to themselves. 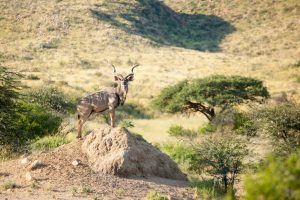 For Tswalu isn’t primarily a tourist destination at all—it is fundamentally a conservation project taken on by the South African Oppenheimer family, whose stated ambition is “to restore the Kalahari to itself”. It wasn’t always so. Once in the not-so-distant past, it was a patchwork of low-grade farms mostly lived on by subsistence farmers whose land had been degraded after overgrazing by sheep, cattle, and goats. I first came to see it many years ago when the late Stephen Boler owned it. A British entrepreneur who grew to love Africa and its wildlife, he bought up the parcels of land one by one, pulled down the fences, got rid of the domestic animals and started introducing the beasts that used to roam all across it. He built some very swanky villas for tourists and kept a part of the grounds aside for hunting. It had, I thought at the time, a breathtaking splendour and, with its rim of purple-tinged, low-lying hills and mountains and its sandy, dry bushveld, a more awesome, austere beauty than the more familiar terrain of the South African Highveld or Kenya’s Maasai Mara. And so today it is in the possession of the Oppenheimer family, who are in the business of making sure that the Kalahari blooms, the wildlife flourishes, and a small tourist operation contributes something to the funds. They stopped the hunting as soon as they acquired it, demolishing buildings and purchasing more acreage, which has given them more biodiversity and even more of the spectacular Korannaberg Mountains. To the magnificent black-maned Kalahari lions, leopards, giraffes, rare black desert rhinos, bands of cheetahs, and all the smaller inhabitants of the bush, they have added Hartmann’s mountain zebras (they differ from other zebras by having no shadow stripe), and they have started breeding programmes for endangered species such as the roan and sable desert antelopes. Only elephants are missing: Tswalu was never their natural habitat and whole herds would do irreplaceable damage to the ancient shepherd’s trees that dot the land. Tswalu means “new beginning” in the Tswana language of the Northern Cape, and it is hard to describe how different it is now from when I first laid eyes on it. Last time, it looked like real arid desert, dry, hot, and the trees and earth and wildlife all seemed to be longing for water. It was even then very beautiful, with a sense of isolation and wildness that I love, but on this occasion it lived up to its moniker as the “green Kalahari”. Wherever one looked, the grass had returned and everything was green, from the rolling hills of the Kalahari dunes to the open savannah. As a guest put it: “I felt as if I were there at the beginning of Creation.” Everywhere the animals were flourishing. 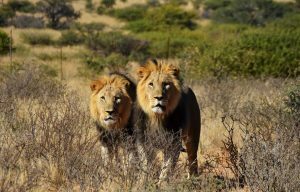 We tracked some black-maned Kalahari lions—bigger, taller, and more awesome than any others, they weigh more than 100 kilograms when fully grown (it took six men to carry a lion that had been darted to enable vets to treat it)—and came upon families of cheetahs tumbling around in the lee of the mountains. 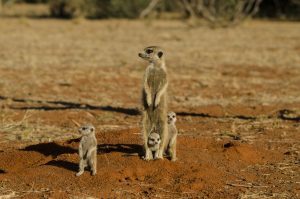 We spent a delightful early morning with a young researcher who was busy studying and habituating a clan or meerkats—they seemed entirely oblivious to us, standing on their legs to check for predators and rushing off in little groups to explore the area around their burrows. Many Tswalu fans come time and time again—often they choose particular weeks of the year in order to study different animals. Those who long to see the hard-to-find aardvarks and pangolins, for instance, visit in winter (July and August) when it’s very cold at night and the animals start to walk around in the late afternoon. Others are intent on seeing a variety of migrating birds. 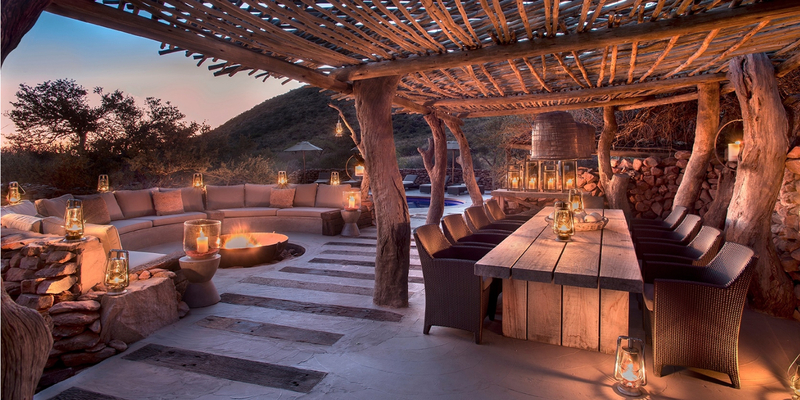 Tswalu is an utterly different habitat from the better-known safari lodges that run along the border of South Africa’s Kruger National Park—it is more remote, vaster, wilder, and therein lies its allure. It was the writer Alistair Graham who noted that “somewhere in the wastelands and their wild animals lie beautiful things, spiritual utilities that we will come to treasure more and more as the pace for life hastens and the space for life diminishes”. If you believe that, I can’t think of a better place than Tswalu to find them. The duke and duchess might undertake a six-month “secondment” abroad.